Spectre Performance is offering a variety of adapters and kits that convert mass air sensors to work with engine swaps. A number of the kits and adapters are designed to convert a boot-in GM sensor to a drop-in blade style GM mass airflow sensor. The Spectre 7153 is used on three-wired systems and converts the sensor without couplers. It features a conversion harness, weld-on aluminum mass airflow pad, and screws for easy installation. The kit requires computer programming to properly calibrate the sensor. The Spectre 7155 has all the features of the 7153, but it is designed for five-wire systems. The Spectre 9774 intake couplers and sleeves for GM mass airflow sensors will adapt the majority of boot-in style GM mass airflow sensors to a 4-inch intake system. The kit includes a 3-5/8-inch to 4-inch sleeve and two 3-7/8-inch to 4-inch sleeves. The Spectre 990003 intake couplers and sleeves have the same features as the Spectre 9774. However, it does not include the two 3-7/8-inch to 4-inch sleeves. The Spectre 9924011 weld-on mass air sensor pad is designed to fit on a 4-inch tube and permit the use of a GM LS7 blade-style mass air sensor with a custom air intake system. 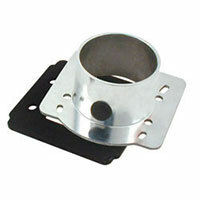 The mass air sensor pad is made of raw aluminum and is designed to be welded into place. 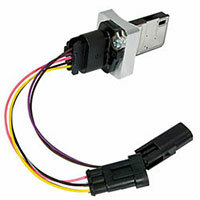 There are also adapters designed to fit Chryslers, Dodge, and Mitsubishi cars. The Spectre 81403 universal mass airflow sensor adapter includes an aluminum body with ABS components and permits an air filter with a 4-inch inlet or a 4-inch intake tube with coupler to mount to the mass airflow sensor. The adapter first mass airflow sensor tubes with 4-3/8-inch by 2-3/8-inch bolt hole dimensions, but will not fit 1988-1994 Eclipse models. 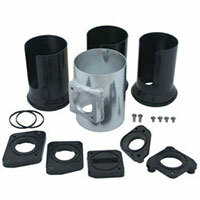 The adapter kit may require drilling additional holes for various applications. 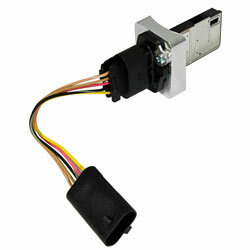 The assortment also includes adapters for Ford engine factory mass airflow sensors. For example, the Spectre 8145 mass airflow sensor adapter connects to a custom 4-inch intake system. 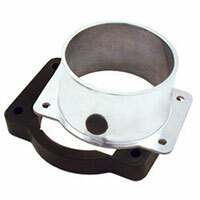 It is designed for Ford sensor tubes with bolt hole dimensions of 3-1/2-inch by 2-7/8-inch. The adapter is made of high quality materials and comes with hardware for an easy installation. The Spectre 8146 mass airflow sensor adapter has the same features as the Spectre 8145, but is designed for sensor tubes with bolt hole dimensions of 3-7/8-inch by 3-1/4-inch. In addition, there are adapter kits for a majority of GM, Ford, Nissan, Honda, Toyota, and other vehicles with drop-in style mass airflow sensors. The group includes the Spectre 9405 3-inch aluminum mass airflow sensor adapter kit with five different sensor adapters and a polished aluminum body. The kit includes three flow calibration tubes measuring 2-1/4-inches, 2-1/2-inches and 2-3/4-inches. The bracket can be welded or couplers can be used to attach to intake tubes and reduces the3-inch intake system to the proper diameter at the sensor to retain calibration. The kit also has five mass airflow sensor adapters and screws on for easy installation. 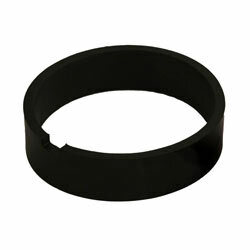 The assortment of universal adapters include the Spectre 81413 mass airflow sensor adapter includes a 3-inch clamp-on air filter or a 3-inch diameter tube that connects directly to the stock mass air sensor to extend it 3-inches. It is fabricated with a combination of aluminum and co-polymer ABS components. So it looks great and is very durable. 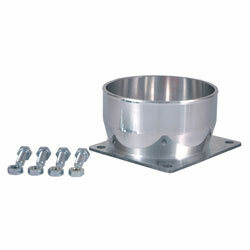 The adapter flange has a 3-3/8-inch by 2-3/8-inch bolt hole setup to accommodate multiple bolt hole configurations. 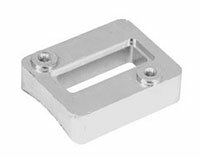 Also included in the group of universal mounts is the Spectre 8705 3-inch chrome airflow sensor mount with coupling collar. It features a triple chrome plated co-polymer ABS resin construction and insulates the intake tract from exposure to heat. 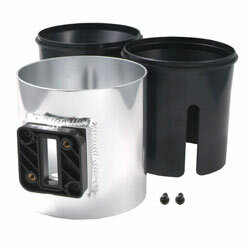 It can be combined with other 3-inch chrome tubes to create an intake for almost any application and comes with three mass airflow sensor adapters to fit a number of applications. Not intended for turbocharged or supercharged engines, the mount works with sensors that have been calibrated to 2,875-inch inside diameter tubes. The Spectre 87051 3-inch outside diameter universal mass air sensor adapter is made of durable co-polymer ABS resin with a chrome exterior finish and protects the intake tract from exposure to heat. It includes a 3 MAFS pads for multiple sensor configurations. Not for turbocharged or supercharged engines, it can be combined with other 3-inch tubing to create an intake for just about any application. It is suggested that it be used with coupling collar P/N 8706 or with standard flexible couplers. The Spectre 9705 4-inch aluminum mass airflow sensor adapter kit is designed for drop-in style mass airflow sensors on 2004 and later vehicles and to be used to create a custom air intake. The kit features an outside diameter measurement of 4-inches by 4-inches long and includes a polished aluminum tube with ABS components and all the necessary hardware. The kit contains two flow calibration tubes that are 76-millimeters and 89 millimeters that reduce the 4-inch intake system to the proper diameter at the sensor to retain calibration. Designed for GM LS series engines, the Spectre 7153 airflow sensor conversion kit adapts boot-in GM sensors into drop-in blade style GM airflow sensors in three wire systems. The Spectre 7155 converts a boot-in GM sensor to a drop-in blade style GM sensor in five-wire systems. The Spectre 81403 is a universal mass airflow sensor adapter that permits a 4-inch inlet or a 4-inch intake tube with coupler to attach to the mass airflow sensor or a Chrysler, Dodge, or Mitsubishi vehicle. 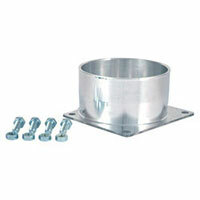 The Spectre 81413 is a universal adapter that permits the connection of a mass airflow sensor with a 3-inch flange to the mass air sensor housing. 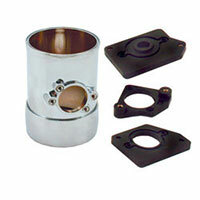 It includes universal bolt hole configuration for multiple applications. The Spectre 8145 mass airflow sensor adapter changes factory mass airflow sensor on Ford engines to a custom 4-inch intake system for sensor tubes with bolt hole dimensions of 3-1/2-inches by 2-7/8-inches. The Spectre 8146 mass airflow sensor adapter changes factory mass airflow sensor on Ford engines to a custom 4-inch intake system for sensor tubes with bolt hole dimensions of 3-7/8-inches by 3-1/4-inches. The Spectre 81413 is a universal mass airflow sensor adapter. The Spectre 8705 3-inch chrome airflow sensor mount has a coupling collar and is made of triple chrome plated co-polymer ABS resin so it can insulate the intake tract from exposure to heat. 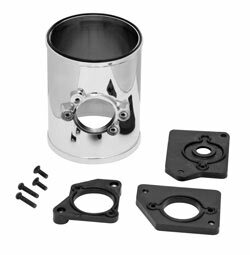 The Spectre 87051 is a 3-inch outside diameter universal mass air sensor adapter that is made of co-polymer ABS resin and a chrome exterior finish so it can insulate the intake tract from exposure to heat. The Spectre 9405 3-inch aluminum mass airflow sensor adapter kit fits a majority of GM, Ford, Nissan, Honda, Toyota, and other vehicles with drop-in style mass airflow sensors. The Spectre 9705 4-inch aluminum mass airflow sensor adapter kit can be used with drop-in style mass airflow sensors on 2004 and later vehicles. The Spectre 9774 intake coupler and sleeves for GM mass airflow sensors changes the majority of boot-in style GM mass airflow sensors to a 4-inch intake system. The Spectre 990003 intake couplers and sleeves for GM mass airflow sensors includes a 3-5/8-inch to 4-inch sleeve to extend and change the majority of boot-in style GM mass airflow sensors to a 4-inch intake system. The Spectre 9924011 weld-on mass air sensor pad permits the use of the GM LS7 blade-style mass air sensor with a custom air intake system.